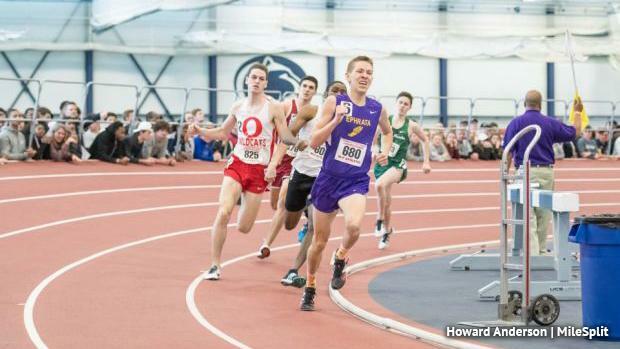 While Liam Conway was running to his second win of the day in the 800 at last year's PTFCA Indoor State Championships, Josh Hoey had just finished up demolishing the indoor national record in the 800 meters, clocking a 1:47.67, a few hours earlier. It's a new season and the national record likely isn't getting touched this winter. But we will have a great battle for the state's spot in the 800 with plenty of talented returners. Topping the list of returners is Tyler Shue of Ephrata. Shue transformed from a relatively unknown relay piece to one of the state's top half milers in less than a year's time. He took a close second to Conway at the indoor state meet in the 800, running 1:53.85. He was also second at outdoor states in AAA and should be in line for another huge year in the event. Perhaps Shue's top challenger in the state in Jonah Hoey, the younger brother of Josh, and Bishop Shanahan junior. Hoey went 1:56 to take ninth at indoor states last year, but had a huge outdoor season that included a 1:52 at Henderson to end his sophomore year. Look for a big winter from Hoey. Another 1:52 runner from last spring is Matt Eissler of Pennridge. He finished just behind Hoey at that Henderson race. After taking eighth at indoor states last winter, expect Eissler to move up this season. David Endres of Central Bucks East went 1:54.9 last winter and took sixth at indoor states, the quickest returning time behind only Shue. He should be a factor again this season. Radnor's Ethan Zeh is coming off a big junior season. Now a senior, he should be in the mix with the frontrunners. Zeh ran 1:56.93 to take 11th at indoor states. Outdoors, he went 1:54.88 to take sixth at outdoor states in AAA. Another contender is Collin Ochs of Council Rock South. Ochs was seventh at outdoor states, just behind Zeh and could also move up big this winter.